Dimitri Hegemann is the founder and operator of Berlin’s legendary techno club Tresor. Here he remembers Kraftwerk’s first concert, which he—at just sixteen years old—attended in 1970. The super rare recording is now available on YouTube. When a friend recently sent me a YouTube link to Kraftwerk’s first gig, everything instantly came back to me. Even the smell. I saw people I hadn’t seen in 43 years and I knew their names right away. Things you experience at that age stay with you forever. At first I was too shocked to keep watching because memories overwhelmed me. We went there by train. Soest in North Rhine-Westphalia was only eight kilometers away and the city’s cultural office held a fair every November for All Saints’ Day. Part of it was a program for the youth, for which Kraftwerk performed in the “Blue Hall”. Of course we had no idea who Kraftwerk were, but liked listening to “alternative music”. That’s what it was called back then. Because the camera doesn’t stay on the musicians throughout, like they do it nowadays, but instead weaves through the crowd, you get a very immediate sense of the zeitgeist back then. At the edge of the stage, maybe a meter away from Ralf Hütter, who is playing a keyboard hanging from his shoulders, are three long-haired hippie girls and a boy with longish hair and bangs, their backs to the band. Naturally, everybody smokes, many of the men wear suits and turtle necks. 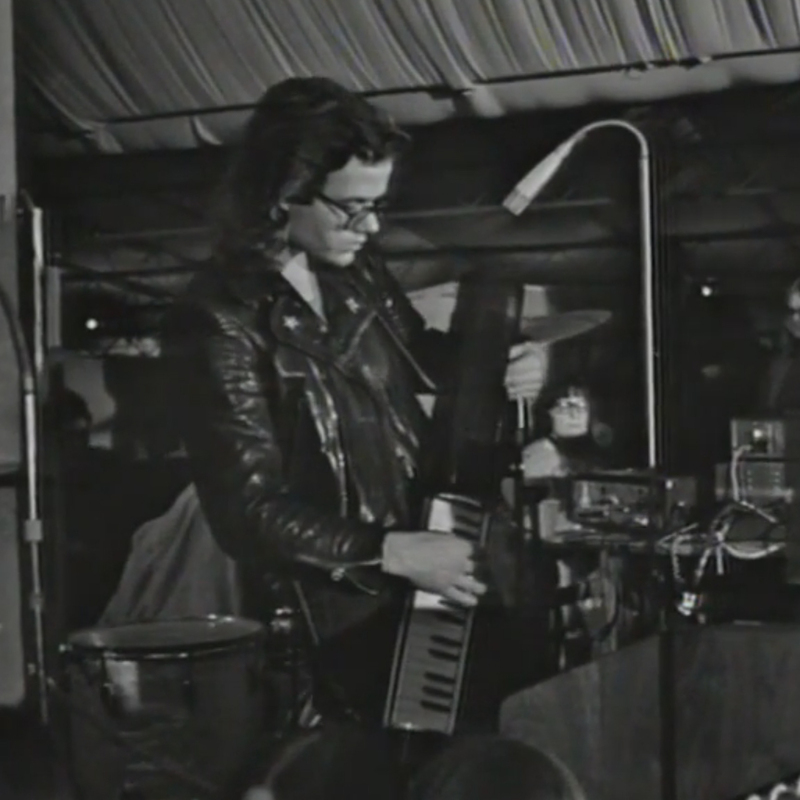 For eight minutes, Hütter sends a droning sound through delays and effect units, before the first rhythm starts, with Klaus Dinger on drums. Florian Schneider plays a Jethro Tull-style flute and the vibraphone, plus various indefinable sounds, but almost all of it is still created with analogue instruments. The audience is bobbing their heads, some with their eyes closed. Part of the crowd sits on the floor with their legs crossed, and some frenetically clap along to the beat. During one of the songs, a guy in a Mod outfit keeps loudly blowing a whistle. The idea of the Man-Machine is not really discernible yet, much more distinct are are the roots in psychedelic experimental sequential music, what you would call “Krautrock” today. For the most part, you can only get the four albums before Autobahn (1974) used on the internet for exorbitant prices, because they didn’t become part of the official canon. This recording shows Kraftwerk before they were Kraftwerk. Later I sent the link to Daniel Miller, posted it to my Facebook page and asked who can find me in the video. The big “Spot Hegemann Guessing Game”. It was 43, almost 44 years ago and yet it feels like yesterday.